Daylilies are not only edible, they are spectacular. After sampling the flowers, flower buds, young stalks and root tubers, I’ve come to the conclusion that they’re so tasty I may grow them as a food crop. I’d read long ago about the edibility of the common lily of my youth, which we incorrectly called tiger lilies because of their orange stripes. But this would have been in the 1980s, when edible flowers reached their trendy zenith. Nasturtium flowers all over the plate, anyone? Meh. My young self wrote off lilies as part of that prancy fad. I first foraged for daylilies in Massachusetts, years ago. Any of you ever been to Cape Ann? Gloucester is covered in daylilies, and its ritzier neighbor Rockport has more daylilies than grass. Daylilies are the most common flower on the whole freaking island. So common my sister Lizz and my brother-in-law Mark have tons of them in their tiny yard. So I am sorry to tell you there will be no stirring tale of high adventure as we stalked the semi-wild daylily. Nope. We just pulled a few plants and picked the flowers and buds from some others that were in the yard. The drama with daylilies is all in the eating. 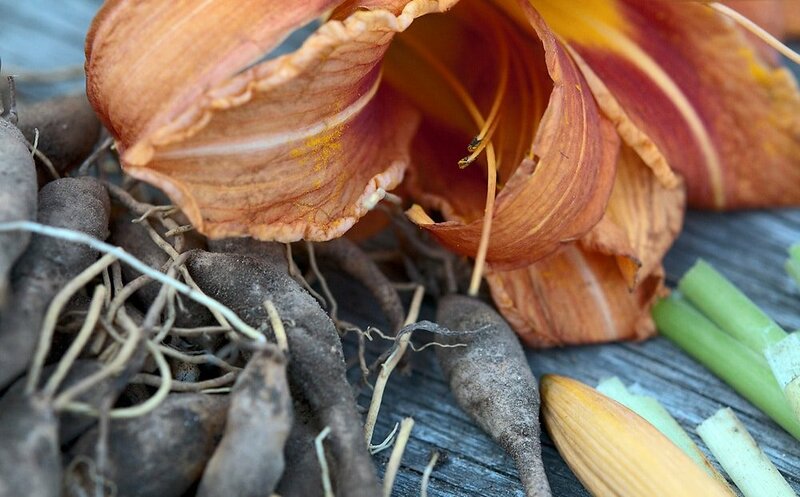 I first separated the plants into flowers, buds, and tubers — unlike true lilies, daylilies don’t have bulbs, they have little tubers instead that look like miniature fingerling potatoes. I then stripped the outer leaves from those plants that had not yet flowered, until I got to the white part. Most sources say to saute the unopened flower buds with a little butter or oil and call it a day. Sounded like a plan, especially since I wanted to really taste the plant, not any supplemental seasonings. 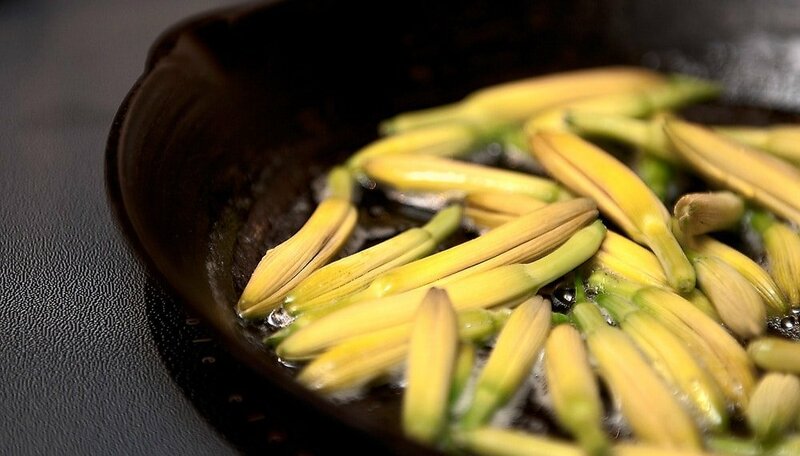 So in they went, just lily buds, butter and salt. Delicious. Briefly cooked, the buds have a bit of knacken, a German expression meaning a “pop.” Yet the insides reminded me of squash blossoms. The taste? Green, with a whiff of radish and a dash of green bean. Honestly, I’d eat this as a side dish any day, any place. It needs nothing else. We tried some of the stalks, but they were not as good. Texture like lemon grass, only without the wonderful lemon aroma. More like a bland, tough scallion. Certainly edible, and not terrible, but nothing like the buds. The flowers are OK. They are more for color than flavor, and they are said to thicken soups the way okra or file powder do. The Chinese use them in hot-and-sour soup. Will have to try that more some other time. That left the little tubers. First thing I noticed was that some looked exactly like fingerling potatoes, while others were pure white, like the inside of jicama. I ate a white one, and it tasted like jicama — only better. Like a raw sweet potato. Or rather a sweet, raw potato, not a yam. I did the same treatment to the tubers: Butter, salt, saute. Only I added some black pepper this time. I like black pepper on my potatoes, so I reckoned I’d like this, too. I was right. These are quite possibly the best tubers I’ve ever eaten. OK, that might not sound like ringing praise, but consider that I am including real potatoes in there and you get the picture. Think really young fingerling potatoes, only with a sweetness to them. White ones are sweeter than the yellow ones. Yellow ones seem more substantial. The only things daylilies have against them are allergies and size. A small number of people who eat daylily flowers get farty and nauseous afterwards; I hear “less than 5 percent” a lot, but I can’t verify it. Suffice to say you should eat only a little at first, the have at it. The second “strike” against the lily, if it can be called one, is size: You’d need to uproot about five or six plants for one meal. But when you consider that hemerocallis fulva is considered a noxious weed in many of the 42 states it’s gone feral in, go ahead. Dig away. 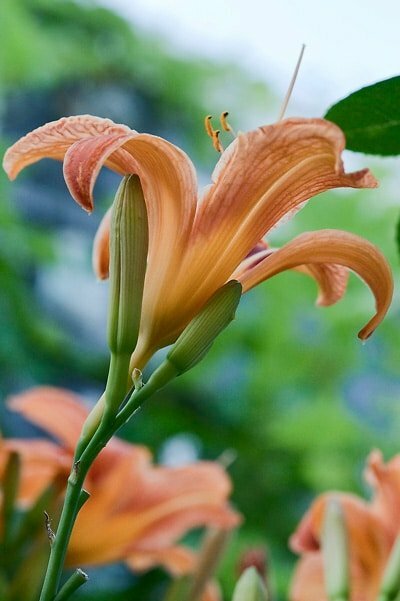 Doing a little more research, I find that according to the USDA, the daylily has gone wild in every state except Alaska, Hawaii, Oklahoma, North Dakota, New Mexico, Arizona, Nevada, and, um, my own state of California. Sigh. 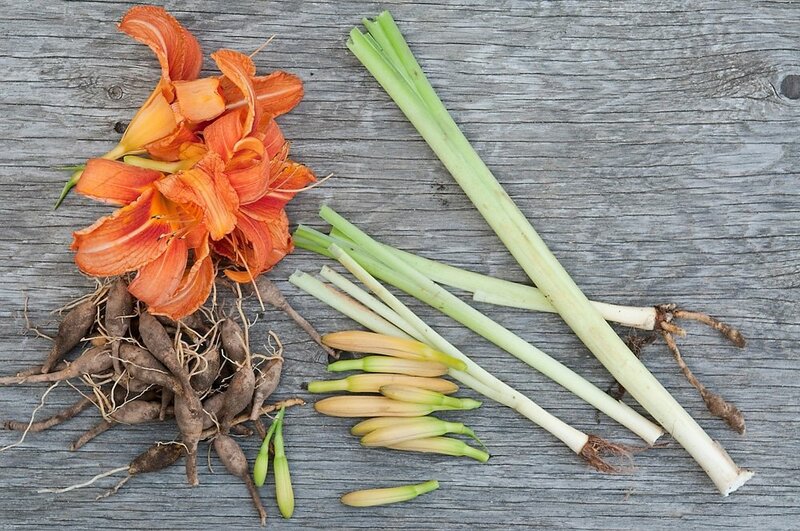 That said, you can’t swing a dead cat without seeing a planting of daylilies in a parking lot or person’s house, and they are so common in urban settings Charlotte Bringle Clarke writes about them in her Edible and Useful Plants of California. Euell Gibbons liked to batter-fry the buds, and lots of other old-timers “creamed” their daylily tubers, which sounds unappetizing. But beyond hippie forager types and the Chinese, I’ve found no other use of the daylily as food. Pity. It is, as Jimmie Walker would say, Dy-No-Mite. From my research the daylily may contain too much oxalic acid for it to be consumed regularly. Different species may be more edible than others. The Golden Needles is H. citrine which is considered a vegetable. The old cultivar Hyperion is hybrid out of citrine and the Orange Ditch Lily H. fulva is a ancient sterile hybrid a triploid derived from crossing a diploid and a tetraploid. I’m told that the old folks from around here only ate the yellow daylilies which was probably the cultivar Hyperion. With zucchini blossoms, I like to stuff the unopened but with a little mild, melty cheese, the whisk them thru a light batter and fry them. Wondering if this might also work with daylilies? I hate to be a downer, but apparently I am part of the percentage that gets sick. Shortly after eating some raw shoots and tubers, my stomach was turning and within half an hour they had violently made their exit. I am certain they were from the correct plant. Kind of bummed because they are so plentiful and I keep pulling them out when they start to encroach on my lawn. But anyway, do be cautious when trying this one.